It’s First Kiss Friday and today I have Judith Sterling returning to my blog. 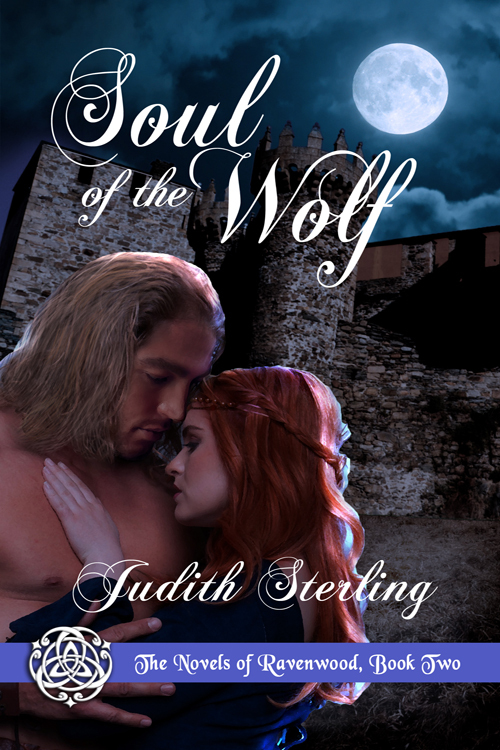 Judith will be sharing an excerpt from her novel, Soul of the Wolf. Happy reading and enjoy! Wulfstan’s expression shifted faster than the midnight clouds. “Why are you here?” he asked in a low, tight voice. Her mind made up, she strode past Wulfstan and approached Woden’s Stair. She raised her foot above the first step. “Stay!” Wulfstan shouted above the wind. He tore his gaze from the forest and settled it on her. “No. The wolf.” With powerful strides, he bridged the gap between them. She stepped backward, and the heel of her boot met stone. Flustered, she clambered onto the step. Wulfstan’s demeanor darkened. “Get down from there.” His large hands invaded her mantle and encircled her waist. She wriggled free of his hands and backed onto the second step. “You could try.” She whirled around and started upward. He grabbed her from behind and hoisted her several inches off the stairs. She struggled and kicked, and her left foot connected with his flesh. “Woden’s blood!” He hauled her away from the stairs and planted her on the ground. “You’ve a clever tongue, my lord.” The hard, hot length of his body pressed against her. He lowered his lips to hers in a feather-light kiss. She gasped at the intimacy of it. He slipped his tongue inside her open mouth and began to explore. ’Twas her first kiss. A secret made known. He’s tasting me, she thought. He tasted like mulled wine. She melted to the kiss and opened her mouth wider. Their tongues entwined in a wet, rhythmic dance every bit as intricate as the patterns of Saxon art. This is magic, she thought. And she wanted it to last forever. He started to retreat. She moaned in protest and thrust her tongue deep inside his mouth. With a groan, he pulled her body hard against him. The kiss grew wild, hungry. His hands roamed over her hips. He squeezed her buttocks. His pelvis pushed against her in a primitive caress that sent shivers through her entire frame. He wrenched himself from her arms and backed away. Thanks so much for having me, Sherry! This book sounds good. Check it out. Great excerpt, Judith! I know it’s First Kiss Friday, but I’m intrigued by the wolf he commands. It hints at a fantasy element, which I love in a book! It sounds good…I’ll have to give it a read! I loved your writing style in your modern-day YA book. Fantastic “First Kiss” excerpt, Judith!